Listing Summary: The property is located just north of the intersection of Cub Lake Road (East Show Low Lake Road) and White Mountain Road in Show Low, Arizona. The parcel is slightly north and east of the Navapache Regional Medical Center. Total Lot Area: 21344.00 SqFt. Commercially zoned land consisting of approximately 0.49 gross acres, or ±21,344 square feet, somewhat rectangular in shape. 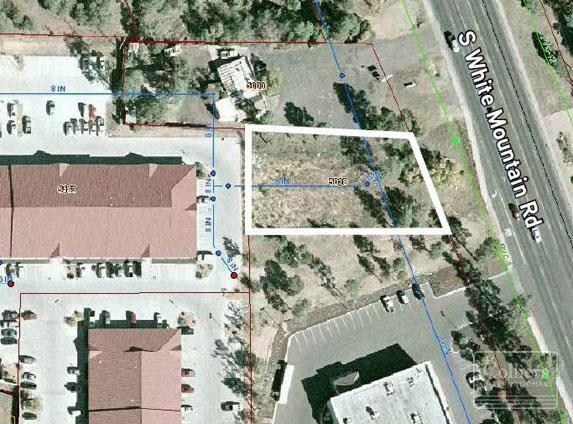 Property address is 5028 S. White Mountain Road in Show Low, Arizona. The property is located just north of the intersection of Cub Lake Road (East Show Low Lake Road) and White Mountain Road in Show Low, Arizona. The parcel is slightly north and east of the Navapache Regional Medical Center. Sale price $122,728 or $5.75 PSF.